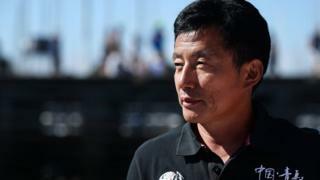 Chinese sailor Guo Chuan has gone missing while trying to break the record for crossing the Pacific alone. The US Coast Guard is now searching waters off Hawaii, where his boat was spotted without him onboard. Mr Guo's support team had lost contact with him at about 07:00 GMT on Tuesday. US ships are now heading to the boat. A Coast Guard spokesman told AP news agency that Mr Guo had been in good health and was an experienced sailor, "so that gives us some hope".